Every year, more developers flood onto the App Store in the hope of finding an audience and some lucrative revenue. The sheer volume of apps means it's hard to get noticed, however, and on the flip side it's difficult for users to find genuinely useful software. So Apple is finally redesigning the App Store. It has a similar look to Apple Music and News, with large, bubble-like cards displayed in a visual feed. You'll start on the Today tab, which has a curated and personalized selection of apps to browse. 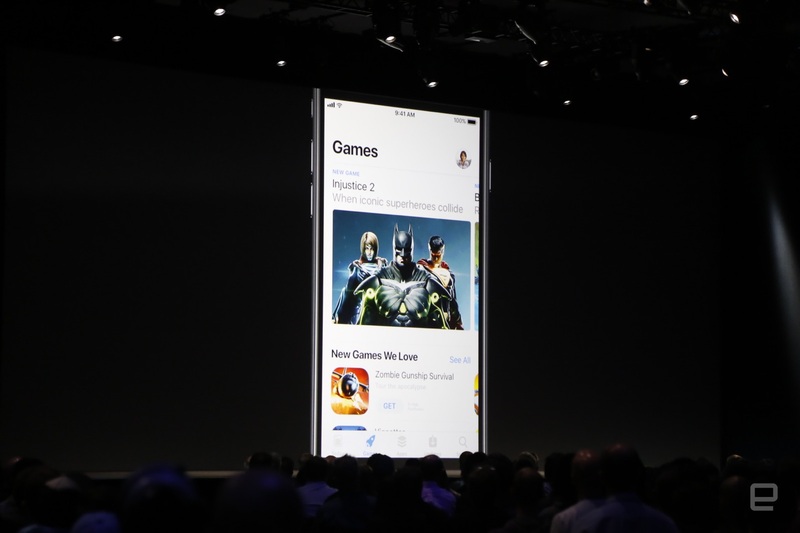 Swipe across and you'll hit Games, followed by (your) Apps, Updates and Search. Apple kicked off the reveal with a "world premiere" of Monument Valley 2, a successor to the M.C Escher-inspired game by UsTwo. Scrolling through each feed, it's clear that less information will be visible on your screen at any one time; Apple is banking on that being a boon, rather than a drawback, however. The company wants to avoid "information overload" by focusing on smaller, specialized app lists instead. There will be an App of the Day, a Game of the Day and even Store-specific blog posts and lists; one example Apple showed was called "5 Tips to Get More out of VSCO." When you find an app, you'll notice that in-app purchases are now available on the same page. That means you can buy photo filters, or sign up for a monthly video streaming subscription without digging through the app itself. Description pages are also being reworked so that developers can write longer, creative notes, rather like a blogging platform. All told, it's a huge revamp for the App Store. The renewed focus on curation is intriguing: It will, in theory, improve app discovery, boosting revenue and competition. If Apple's efforts fail, though, it could exasperate the store's existing issues, making it harder than ever for developers to earn a living.